Four years after the release of their last studio effort "Rubicon" in 2005, flanked by a Live album in 2007, here is the latest record from the kings of "heavy seventies hard rock sung in swedish"; Abramis Brama. The title on the new album "Smakar Söndag" (Tastes Sunday) reflects over the time passed since "Rubicon" and the trials and tribulations offered, a somewhat dark stew one might think. 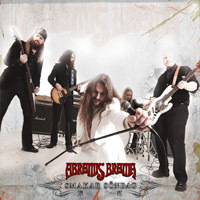 True in a sence but it also contains material written over a time span of more than 12 years, so one could say that this record is the essence of Abramis Brama today; Where they´ve been, where they´re at, and where they´re going! Since "Rubicon" they´ve lost original drummer Jansson (now with Witchcraft), added guitarist Rob (borrowed from Backdraft) and drummer Trisse (from Grand Magus). Top notch quality ingredients right there! Adding to this, the record contains guest artists such as Moa Holmsten on vocals (previously with Meldrum), Rolf Leidestad on keyboard, Jonas Kullhammar (grammy award winning jazz saxophone wizard) and you´re guaranteed your normal footstomping, headshaking, ledheavy riffing dose of Abramis + more!